Pasta with sautéed cherry tomatoes and spinach – a quick and easy pasta dish featuring sautéed cherry tomatoes and spinach. The pasta and vegetables are combined with kalamata olives and parmesan creating a fresh, easy pasta dish. I know I should be thinking about salads, now that it’s January and the holiday overindulgences are behind us, but with the cooler weather it’s pasta I want. This pasta with sautéed cherry tomatoes and spinach is a quick and easy dish packed with sweet cherry tomatoes and earthy spinach. 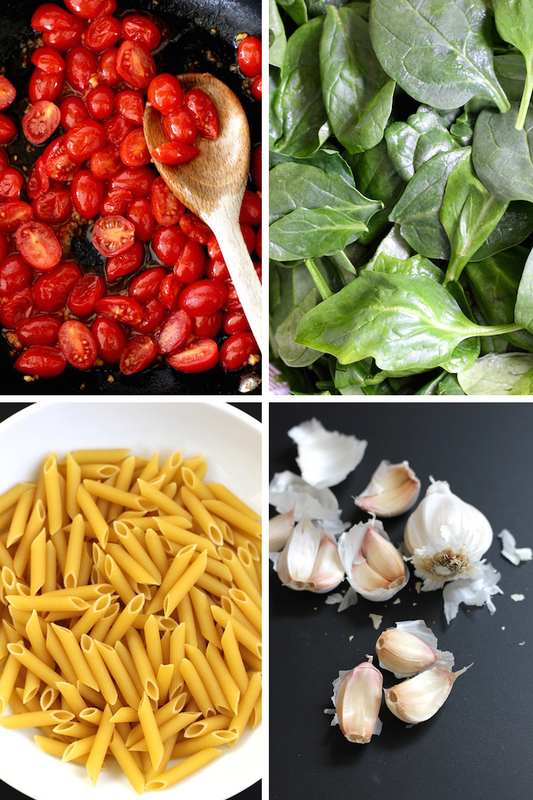 The cherry tomatoes and spinach are sautéed with garlic which adds a pungent bite to the dish. Once the veggies are sautéed they are tossed with the pasta, some chopped olives and parmesan cheese. An easy, fast pasta dish that take about 20 minutes to come together. This not a heavy, oily dish. You start by sautéing the spinach – a handful at a time – adding more as the spinach cooks down. Cherry tomatoes are sliced in half and then briefly sautéed until they release their juices and collapse in on themselves. Garlic is added to both the cherry tomatoes and spinach as they cook giving the dish a heady, garlicky kick. You want your spinach to be very dry when sautéing it. So give it an extra spin in your salad spinner before sautéing. If it’s too damp or wet it will water down the sauce. So after sautéing the spinach, if you see a lot liquid in the bottom of the pan just strain it off. Rather than sautéing the spinach as whole leaves, you should roughly chop up the spinach before sautéing. This will prevent the spinach from clumping up too much when you toss it with the pasta. This dish comes together very quickly, so have everything prepped and ready to go before you beginning cooking anything. You should be able to have everything prepped before the water comes to a boil. 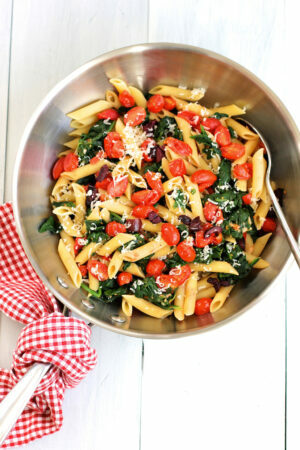 A quick and easy pasta dish featuring sautéed cherry tomatoes and spinach. The pasta and vegetables are combined with kalamata olives and parmesan creating a fresh, easy pasta dish. Bring a large pot of water to a boil. Add one bouillon cube. While the water is coming to a boil, prep and chop your cherry tomatoes and spinach. Mince garlic. Roughly chop olives and grate cheese. When water comes to a boil, add pasta and cook as per package instructions. While pasta is cooking, add 1 tbs of olive oil and garlic to a large sauté pan and cook for 30 seconds over medium high heat until briefly cooked – stirring the whole time so garlic doesn’t burn. 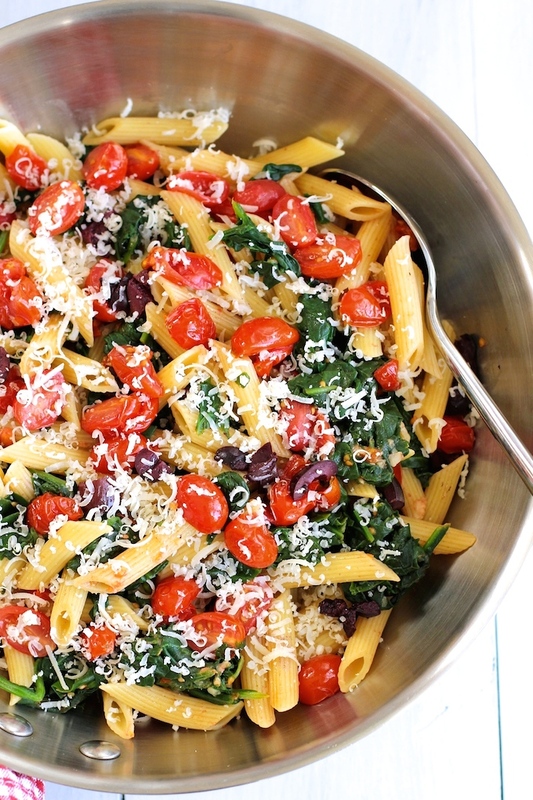 When pasta is done, strain and add to the bowl with cherry tomatoes and spinach. Add chopped olives and 2/3 of parmesan cheese. Toss to combine. Sprinkle remaining parmesan cheese over the top of the pasta and serve. 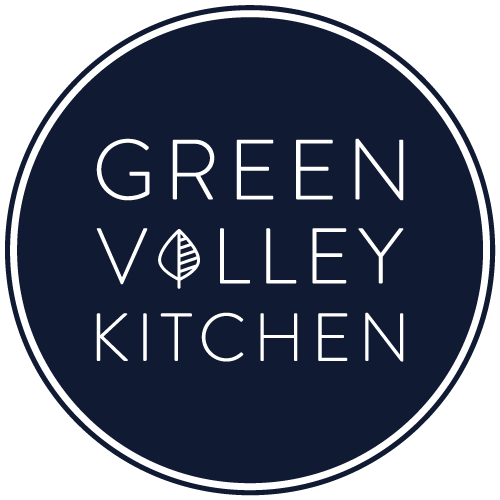 Just made this for dinner – it was great! But now I need to know, What’s the best way to reheat the leftovers?? Hi – Sorry to get back to you so late – but I’m glad you enjoyed it. I actually ate the left overs cold – which was really good. If you want to reheat – I would add a little olive oil or some veggie stock to a saute pan and then add the cold pasta and toss until warmed through. I love simple and fresh meals like this, looks so delicious! I with you on the garlic, Denise – the more the merrier! Have a good one! This pasta looks super delicious! Love the colours and flavours.Yummy! I love simple and flavorful pasta dishes like these, Geraldine. I bet the garlic adds so much flavor, and I really like the addition of olives for a nice salty kick. These are the kinds of recipes that are great for busy weeknights. Thank you for the inspiration! Thanks, Julia! Hope you try it – super easy to put together and it works well cold the next day for lunch! Have a good one! Hi Izzy – I agree about fast and easy pasta dishes – I could eat them everyday – and the more garlic the better! Have a good one. This recipe speaks to my heart! These are the flavors I love! And there’s nothing better than a quick homemade meal like this to brighten up any chilly winter’s day. And I concur with Traci, your photography absolutely captures the essence of your dishes. Thank you, Geraldine! Thanks so much, Annie. I just love pasta – and an easy, fresh pasta is my favorite kind. Have a great day! My goodness! Love the colors in this dish and the styling is beautiful! You’re photography is so sharp and those veggies! Oh my! The kalamata olives add such a depth of flavor; I adore their pungency, especially with the flavors you’ve combined in this recipe. This would be so good with a greek or caesar salad. Thank you for sharing your recipe, Geraldine! Hi Traci – I agree – a salad would make this a perfect, easy meal. Thanks so much for the compliments!! Hope you have a good one (and feel better soon)!